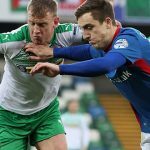 Barry Gray has backed his players to respond to yesterday’s frustrating Danske Bank Premiership stalemate with Linfield. 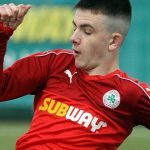 After taking the lead through a Joe Gormley header, the Reds were pegged back when the visitors – who had skipper Jamie Mulgrew sent off after 26 minutes – scrambled an equaliser five minutes from time and, though Gray admits the draw “feels like a defeat”, the Manager refuses to be downbeat. “We’re not going to pretend to be pleased or happy but, at the same time, we can’t live in a bubble of negativity,” he explains. Gray believes the Reds contributed to their own downfall by not kicking on in the aftermath of Gormley’s opener but says the signs are encouraging for this season’s prospects. “I can’t fault anyone for the shift they put in, there was a massive amount of hard work that went into that performance,” he adds. “We went with an attacking line-up, one that maybe surprised a few people. I think there were people not playing who would have been expected to, but we went with a team that we believed could win the game. For whatever reason, we didn’t quite get it together in terms of how we attacked. There were good patches in the game, but it wasn’t really consistent enough and, when we did get the goal, we retreated back to the edge of our own box. “All through the match, we had kept a high line and had dealt with Linfield pretty well but, once we had something to defend, we played into their hands a bit by dropping deep and inviting them on a little bit. The equaliser is a poor goal to give away and it comes down to what I’ve said before about game management and just learning to see things out, but that will come. 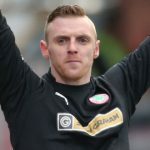 “It feels like a defeat but, instead of constantly hammering people with negatives, let’s try and take the positives – it’s another 90 minutes for the two centre-halves together, it was Conor McDonald’s first game back and Joe Gormley scored a header!